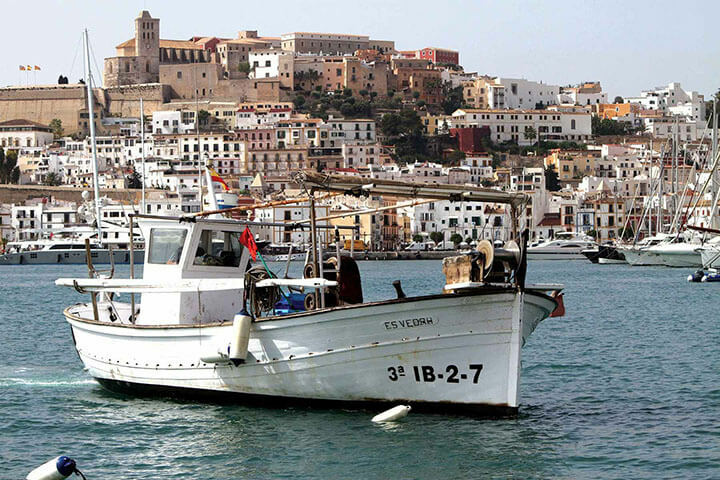 We visit Toni Sastre one morning in early May, just as he is mooring his fishing boat, the ‘Es Vedrá’’, in Ibiza harbour. 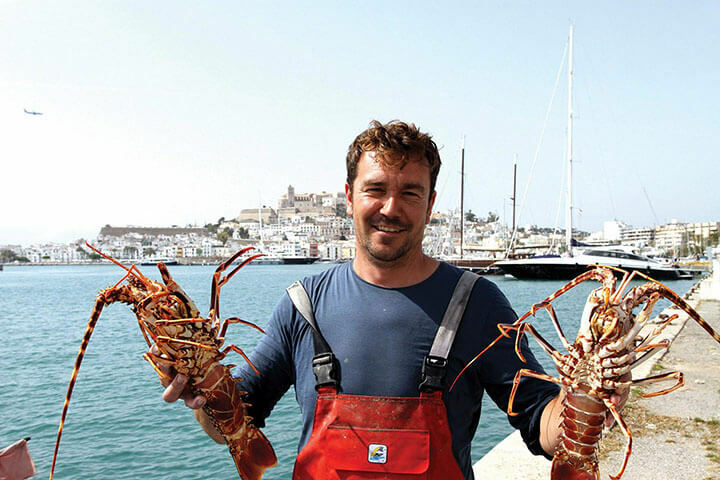 This young ship owner and sailor explains to us how the ibizan lobster is caught. 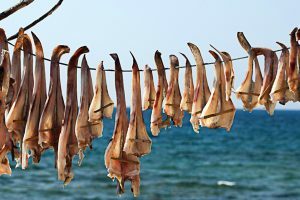 This most delicious of delicacies, which is offered up by the crystalline, Pitiüsian waters, may be enjoyed by those mortals who can afford it, thanks to the work of a few fishermen like our dear friend. The lobster is one of the most highly esteemed crustaceans throughout the length and breadth of the planet, and those which are caught in Ibiza´s waters belong to the Palinurus elephas species, which are highly prized gastronomically. So much so, that they are one of the products included in the list of the Sabors d’Eivissa, or Flavours of Ibiza, brand, an initiative of the local Council to promote and showcase traditional produce from the lands and seas of the island, following the guidelines of the regional government. 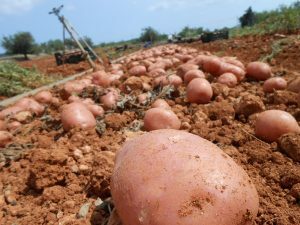 The idea is to facilitate the identification of genuine produce of Ibiza. In the case that concerns us, it is a way of differentiating lobsters sold on the island from those caught in other parts of Spain or off the African coast, which are usually of inferior quality to those caught in local waters. Toni Sastre, the owner of this lläut, or traditional Ibizan fishing boat, the ‘Es Vedra’, is the owner of one of some twenty boats engaged in the profession of lobster fishing in Ibiza. Just two years ago Sastre acquired this beautiful wooden boat, which is 10.3 meters in length – “55 hands, as they say around here,” he points out – and so far he is delighted with his new trade, which he is learning from the previous owner, who for now has taken on the roll of of skipper until he eventually retires. Accustomed to dealing with tourists in his previous job, as the captain of a tourist boat in San Antonio, Sastre is happy with the change, despite the early mornings that it demands. During the period that the ban on ibizan lobster fishing is lifted, between April 1 and May 31, his usual routine is to set sail from the fish quay of Ibiza at around six o’clock in the morning, to go and collect the nets which have usually been lowered the evening before, or 48 hours before at most (as permitted by law). The ‘Es Vedrá’ usually operates between Santa Eulalia and Formentera, about two hours journey from the mouth of the Botafoc. Once at the point where the netting is to be found, the most arduous task of the day begins, which is none other than hauling in the nets, in the hope of finding a good catch. The netting used for this kind of fishing is the trammel net, one of the most frequently used types of net in artisan fishing. The rigging consists of three superimposed layers of net (or cloths) where the catch, in this case the lobster, becomes ‘entrapped’, although they do not usually come alone, but are usually accompanied by other crustaceans. Normally each section of net is 50 metres long and two metres high, and several are joined up end to end, with up to a maximum of 40 nets per crew member. With three crew members a maximum of just a 100 nets may be dropped. The most important thing is to know the best fishing grounds, knowledge which is gained with years of experience by each skipper, and which is closely guarded and never revealed. 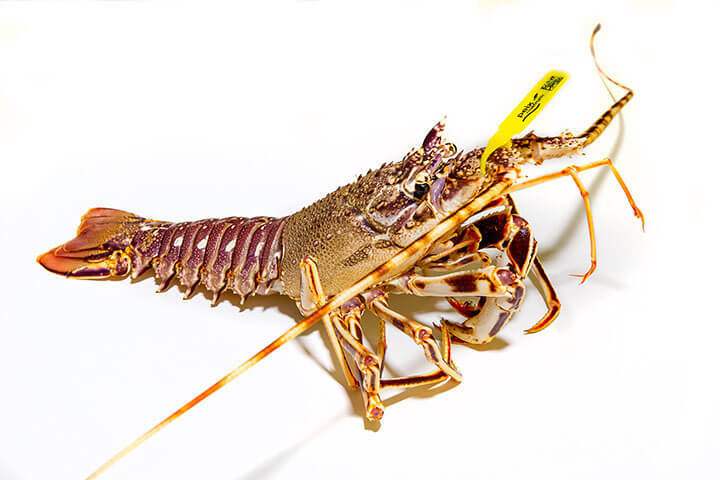 The ibizan lobster is usually caught on rocky seabeds at a depth of between 50 and 100 metres. The day we spoke with Sastre he had collected a total of 14 nets, that is to say 700 metres of netting, which took a little over an hour to get on board. Once all the nets, which may be cast at several different points, have been hauled in, they embark on the journey back to port. They now have two lobsters and several kilos of fish on board which, by the time they reach the harbour, have already been carefully placed in the boxes bearing the mark of the fishermen´s brotherhood, with enough ice so as not to lose their freshness. In the case of the lobsters, they are covered with damp cloths so that they do not die and reach the port still alive. Normally they catch from two to fifteen a day at most, and an average of five or six. 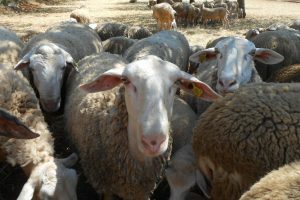 They are caught almost “on demand” to allow the catching of them to be truly sustainable. And although it appears that the lobster population has remained stable for years, less are now caught because, strange as it may seem, there is less demand. Sastre blames this on the fact that most establishments which offer lobster on their menu, obtain them from outside, mainly from Mallorca, where they are sold at auction, and where, early in the season, large quantities may be bought at prices which are cheaper than those of this island. Hence initiatives such as Sabors d’Eivissa and the Peix Nostrum, Our Fish, brand launched by the fishermen´s brotherhood itself. 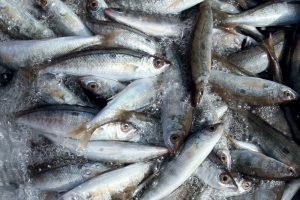 Through this hallmark of quality, which has been in existence since 2008, the consumer knows from the outset that the fish or seafood has been caught by the Ibizan fleet. But once in port the work is not ended. They have to land the catch and weigh and label it correctly. Sastre then returns to his boat to prepare the netting and mend it if necessary, to have it ready to go and cast again that very afternoon. A hard but rewarding job, as he admits. Upon leaving, we give him our word that one day we will accompany him to the waters of Formentera with the hope of getting a good catch to be able to tell you about on these pages.